Comment Captivator is a WordPress plugin that helps you increase your blog readers interaction with your website. With Comment Captivator you’ll encourage your readers to come back over and over to every new blog post you make & leave comments every time! 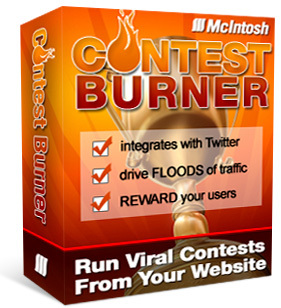 I’ve set up this post to use one of my favorite features of Contest Burner… Incentivized content! What this means is that with Contest Burner you can ethically “bribe” your website visitors to sign up to your contest & take actions in your contests. You can reward them with: coupon codes, download links, video training or anything at all that would fit in a webpage! In this demonstration I have a very special piece of software that works with WordPress that I’m GIVING AWAY to ALL active participants in the current contest. If you haven’t signed up yet: you must go here now, sign up & start taking actions in the contest. When you have at least 60 points… BOOM! the download link will magically appear below! If for some reason the page doesn’t recognize you as having entered the contest… just visit the contest page & put your email address in again. The system should then realize who you are. Let me know what you think of this new feature. Plus… when you comment below after joining the contest you’ll get even more points! I joined the contest yesterday, posted on FB, followed the links to here and to video2. All of this should have earned me well over the min. 60 points needed, but it tells me I haven’t entered the contest. Somethin’ ain’t right. Download link not working for me. Download link is fixed. Some strange issue with WordPress, but it’s fixed now… enjoy! If the download page doesn’t recognize you as a contestant… just go enter your email address in the contest page again & you’ll be all set. Contestburner uses “cookies” to remember you & your browser probably deleted them. Working great already setup a contest on one of my websites! Can’t wait to take it for a whirl! had 1 Point! Still no software link. What now? Thanks again Bill. We look forward to testing it out. Link working fine now. thanks. Off to try it out now. I have well over 500 points but the page is still saying that it looks like I haven’t entered the contest. Therefore, no download link. Hopefully, it’s not the same amazing sofware that’s running this particular contest. No offense, but I don’t want it on my website, if that’s the case. You did say the new version was still in beta testing, so I hope you get the bugs worked out. If so, you’ve got an amazing product. Whole thing is a nice idea, but not working well. It says I have 28 points – I should have more from facebook, twitter and youtube. Wow! Is this some kind of joke? I don’t see no link to download a plugin and you know what else, I watched your video #2 and don’t see my extra 100 pts in my standings either. So what’s up with that? Must still be working out the bugs, but hey that’s a good bribe or theory to give. @Ana Enter your email address again (on this page). If it still doesn’t show, refresh the page and it should then appear, as it did for me. @Terry. Did you click through from the email to watch the video? (I believe thats the only way to gain the extra points). Or try giving the leaderboard an hr or so to update. Sometimes it seems to update instantly, sometimes it takes a little while. @Adam. The leaderboard shows you now on 11 (you got 10pts for the comment here). Looking at the Twitter account against your name, it shows zero tweets. Also, if you have a YouTube account, add that info (if you can after setting up your username here) as it’s an easy 300pts for subscribing to the McIntosh Marketing channel. It’s not working for me either. I have cookies enabled. I AM logged in. I clicked the link in the email. I clicked the “Like”. I refreshed the page. It still shows I have only 3 points. Firefox 3.6.6. Three days I’ve been entering this contest every day at least once, sometimes more. Upon entry I get the full checked off visual for Facebook 2X and Twitter plus video comments but no link to this elusive software. The WIIFM is not very strong for continuation. I have followed the repair links and still nothing. Having the same problem. Should have 600 points or so but only showing 51. As I subscribed to your YouTube channel, I should have well over 300 points However, since I have 89 on your scoreboard, I should be able to see the link for the plug-in download on this page. I’m also having problems with the link. Hope this problem won’t happen in my contest. For some reason links not working?? It’s either that or its very confusing how to earn points as i have done so but it says first time here again and again.?? Sorry to be pain but can anyone tell me how we should see our points?? Its a bit anoying as ive JV’d and about to put aff links on my 100 visists/day website but if its not working im not going to promote any help anyone? This is a really cool system. I clicked to read the post here and my download link was right there. Has anyone actually used the Contest Captivator software to create a contest? I am really fired up, but obviously I am missing a piece of the puzzle. I have the software installed. Contest pages get created for me, but I cannot click on any of the links to actually set the contest up. I am sure I am missing something, but not sure what it could be. I got the email to download the software but was sent to the page to join the contest. How do I get to the downlaod link to the software? None of my points are being registered either. And everytime I come back it forgets who I am. Am I doing something wrong? I’ve been pimping like a crazy woman and can’t track the points. I Love this contest, I’m wishing on a star that I win a prize today points, points, points, points! I have purchased my software and will be setting up my first contest this week. I believe that this will be an excellent tool for both myself and my clients. I am concerned about the problems with points. I didn’t track mine but I know my customers will. Also, were there bonus points (1000 or 2000) given out yesterday? I didn’t receive any points and dropped like a stone in the rankings? Very easy line to add isn’t it?